The Food Trust's popular Night Market series. 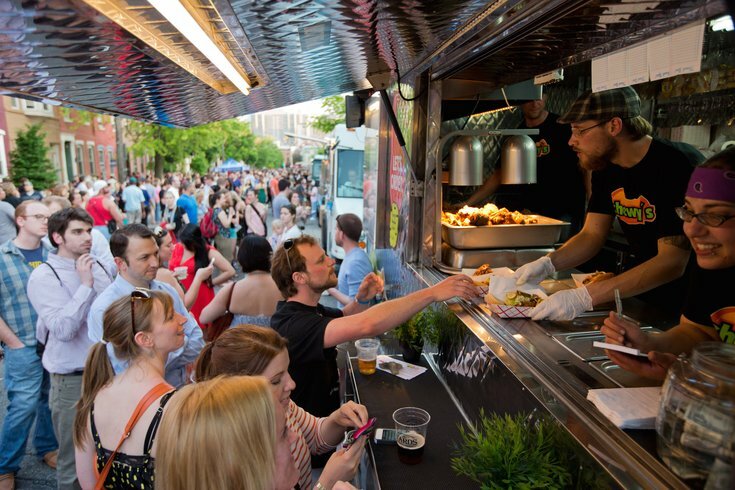 While food trucks may often be the most convenient and tasty way to grab a bite to eat in Philadelphia, they aren't always the healthiest option. One group of students at the University of Pennsylvania is trying to change that by teaming up with The Food Trust. The student group Healthy Food Truck Initiative (HFTI) and the local nonprofit have teamed up to create the "Healthy Food Truck Certification Program" in hopes that the city's popular vendors will start to offer leaner, greener menu items. HFTI has been working with the school's public health arm and Penn professors to create the criteria trucks would have to meet to be certified. Trucks that meet the requirements - including whether they offer water, serve 100 precent whole grains or have at least two vegetarian menu options - and pass an application and review process get a fancy decal to add to their truck saying they're certified. Recertification runs every two years, and trucks can advance in the process to receive more stickers. The collaboration hopes trucks will see the value in setting themselves apart from other uncertified vendors at big truck events like The Food Trust's Night Market. In addition to reviewing and certifying trucks, though, the group will also help trucks that don't meet qualifications by providing nutritional counseling and putting them in touch with vendors that might help them meet their goals. So far, popular University City trucks Schmear It, Magic Carpet, Chez Yasmine and Jerry's Kitchen have been certified, with many more on the way, HFTI says.